Sitting down with a designer at Paul’s Quality Kitchens can help all of your brand new kitchen design dreams come true. Our team is highly trained and experienced to work with all of the latest custom kitchen designs to provide you with the best possible results. With over 25 years of experience serving the Greater Fall River area with top quality kitchen cabinet colors and styles, we can help you choose the best materials to create the aesthetic appeal and function that you have always desired. Pick from a wide range of beautiful Massachusetts kitchen cabinets in our Fall River showroom or work with our team for custom opportunities. Whether you are remodeling your kitchen so you can upgrade it and sell your home or if you are finally making time to create your dream kitchen, Paul’s Quality Kitchens can help. It is essential to pick the right type of countertops to match your new Fall River kitchen cabinets to ensure a cohesive look and feel. Modern trends focus a lot on color, but also on texture and variety when it comes to kitchen materials. One of the most popular trends in the past few years is quartz. The good news is that the longer it hangs around in the top five for home remodeling, the better staying power it will have in the future. Design trends come and go throughout the years. While some things work with a traditional or classic design that will look great no matter what the current trend, other items, colors, and styles may stick out like a sore thumb in just a few years. Think about all of the color choices from the 60s and 70s, like those avocado appliances and goldenrod wallpaper designs. Homeowners have been ripping them out and replacing them with more neutral shades for generations. While these colors may come back in vogue again occasionally, they are generally too polarizing to have any kind of staying power. While granite had a nice long run with homeowners in the Greater Fall River area, there were a few drawbacks. Many complained about common issues, such as surface staining from spills of liquids, such as water, oils, juice, soda, and wine. The naturally porous nature of granite means that it needs to be sealed throughout its lifetime with a non-porous sealant to prevent the breeding of bacteria. Quartz has all of the benefits of granite, such as long-lasting strength and durability, yet is very low-maintenance in comparison. It is naturally non-porous and does not have to be re-sealed, making it resistant to staining and one of the most hygienic choices for countertops available today. 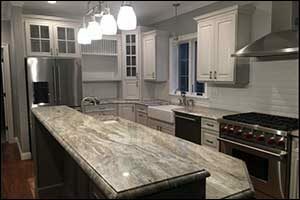 When matching your new quartz countertops to Fall River kitchen cabinets, you will have many colors, patterns and finishing techniques available that can be used to mimic the look of natural stone. Matte finishes, colors, veining, and unique installation patterns can be used to create a custom look for your brand new kitchen design. Polished quartz is by far the most popular choice to go with today’s modern kitchen cabinet colors and even traditional Massachusetts kitchen cabinets and styles. However, there are other surface options available for those who want to try something more textured and tactile for their home, including honed and leathered finishes, which are less glossy and provide a unique feel. Shopping for materials to use in your custom kitchen designs can be a lot for the average homeowner to deal with on their own. Working with a team of designers and professional installers at Paul’s Quality Kitchens can help. Making selections on key items, such as sinks, flooring, appliances, and fixtures work to bring the overall theme or design trend that you are going for throughout the space. New trends in sinks, for example, include matte black sinks and fixtures in brilliant brass and gold. Oversized sinks and continued interest in apron front or farmhouse sink styles also remains popular in the coming year. Choosing Fall River kitchen cabinets can be the biggest challenge. Make sure you invest in quality materials that will provide you with many years of reliable and sturdy use, as well as create a beautiful focal point that instantly makes a statement in the room. Dark tones, grays, beiges, and other neutral shades are still popular in 2019, accented with intricate designs for backsplashes, high-performance appliances, and coordinating flooring options. When you visit Paul’s Quality Kitchens, you can see our selection of Massachusetts kitchen cabinets and work with an experienced designer to pick kitchen cabinet colors, styles, and specialty options based on your unique needs and interests. Contact our team by calling 508-324-9464 to discuss making an appointment for an initial consultation. We will come to your home to discuss your ideas for brand new kitchen design, layout, and Fall River kitchen cabinets so we can provide you with a comprehensive estimate for the work that needs to be done. Call today to learn more about our custom kitchen designs or to schedule a meeting with one of our design consultants.